Ageing African presidents who try to cling to power by manipulating constitutions and judiciaries risk the same popular rebellions that toppled rulers in last year’s Arab Spring, Nigerian Nobel Laureate Wole Soyinka said on Wednesday (February 01). Citing as examples Zimbabwean President Robert Mugabe and Senegalese President Abdoulaye Wade, who are both well in their eighties, Soyinka criticised “sit-tight rulers” who sought to hang on in office despite being “obviously beyond their prime”. “I sometimes suggest that maybe the problem vwith us.. with our African leaders is that coming from societies which rather value rituals, that really what they are seeking is a state funeral, with all the African ritualism that goes with it, because I do not see why somebody for instance like Mugabe should still attempt to cling to power one day longer,” Soyinka said. One of Africa’s leading intellectuals, Soyinka, 77, spoke to Reuters in Pretoria after addressing academics and members of the public at the University of South Africa (UNISA) as keynote speaker for the Africa Speaks lecture forum. 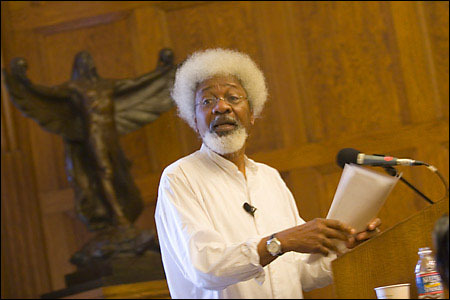 An outspoken critic of dictatorships and autocratic rulers in his native Nigeria and elsewhere on the continent and in the world, Soyinka said while he saw differences between the Arab world and Africa, he predicted African rulers who abused their powers to stay on for years could face their own “African Spring”. “There is a kind of qualitative difference between dictatorships on the African continent, black Africa and in the Arab world, but ultimately I’m sorry to say we’re talking about violence. In the end, those who refuse to bow to popular will, who continue to treat, to describe and regard their own peoples as being inferior to themselves or their petty clans, I’m afraid will confront the same nature of violence as we witnessed in the Arab world,” he said. The prolific playwright and author in 1986 became the first sub-Saharan African to win the Nobel Prize for Literature. Turning to Nigeria, where he was imprisoned in 1967 for attempting to broker peace in the civil war over secessionist Biafra, Soyinka said both religious and political forces were driving the insurgency by the Islamist sect Boko Haram that has killed hundreds of people in Africa’s top oil producer. “Those who unleashed Boko Haram on the nation are politicians, but Boko Haram in terms of a tendency of political extremism, of extreme and potential violence, has always existed. It has existed, the members, the foot soldiers of Boko Haram were bred in the madrassas, we call them in Nigeria almajiris, and even there they have been available as instruments of mayhem, of destruction against other political interests, a part from the interests of their political mentors. So it’s really basically a two-headed monster,” he said. Soyinka proposed the holding of a national conference, bringing together all sectors of Nigerian society and all national institutions, to discuss regional grievances and problems and thrash out a national consensus for the future.